Mon, Feb 11, 2019, 08:28 am SL Time, ColomboPage News Desk, Sri Lanka. 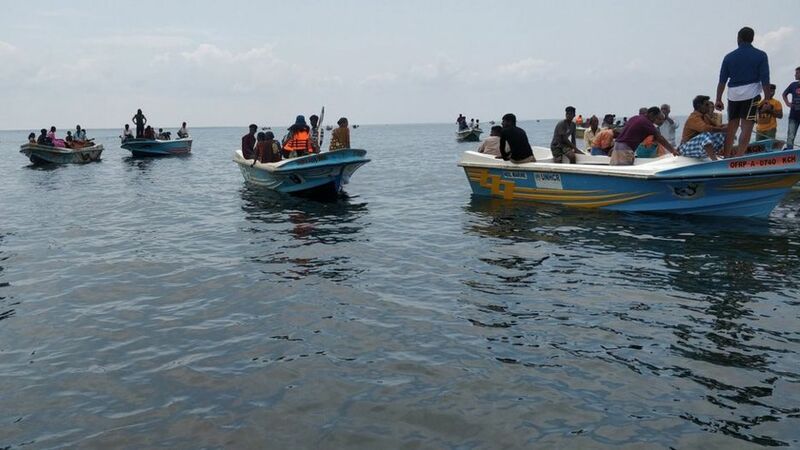 Feb 11 (BBC) Last year, a flotilla of 40 fishing boats set sail from northern Sri Lanka with a mission to seize back their island from navy occupation. The BBC's Ayeshea Perera reports the extraordinary story of how they did this without any bloodshed. Iranaitivu is really made up of two linked islands - Periyathivu and Sinnathivu. It lies in the Gulf of Mannar, between the southernmost tip of India and the north of Sri Lanka. Aquamarine waters so clear that the fish swimming in it are visible to the naked eye, starfish on unspoiled golden beaches lined with swaying coconut palm fronds, waters so shallow and calm that you can walk about half a kilometre in without it ever reaching your knees� the beauty is almost unreal. Iranaitivu's people say they were displaced in 1992 by the navy, who built a base there during the height of the civil war between government forces and the separatist Liberation Tigers of Tamil Eelam (LTTE). They are not alone - thousands of families in Northern Sri Lanka accuse the military of having occupied their lands during the war.